The local entertainment industry woke up to a very sad news this morning. 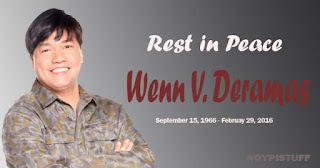 According to news reports, blockbuster director Wenn Deramas has died after suffering cardiac arrest. He was 49. "Isang napakalungkot na araw. Sagad hanggang buto ang lungkot. Paalam Direk Wenn. Mahal na mahal kita," actor and comedian Vice Ganda, who worked with the filmmaker in several successful projects, said in a Twitter post. Direk Wenn helmed three of the top 5 highest grossing Filipino films of all time -- "Beauty and the Bestie" (#1), "The Amazing Praybet Benjamin" (#3), and "Girl, Boy, Bakla, Tomboy" (#4) which were all starred by Vice Ganda. A University of Santo Tomas graduate, Deramas started as a production assistant and later worked as a writer and executive producer before he directed TV shows and films. Among the hit soaps he made were "Mula Sa Puso," "Kampanerang Kuba," "Kokey," and "Dyosa." He marked his 25 years in showbiz last year with the release of his biography book titled ""Ang Direk 2 Da Poynt."